Balance bridge offers the best "ground up" climbing in the gorge. blank face. If the landing was better it would be a great boulder problem! bridge is located 6.6km from the start, and signifies the end of the gorge. Safwan's Boulder Ahhhh, poor Safwan...... allergic to ropes. He decided the landing was good enough on this small face to warrant giving it a little love. Lowtide Rock This hard little rock is right down by the water (on the left hand side of the group if you are looking down from the bridge) and is only accessiable when the river is down and not worth trying until the ground underneith is dry. Red Block- This is the first "cliff" you get to when you walk down the track from the road. It is red (duh), slightly overhung and offers 3 good lines to play on. Climbs are listed from left to right. 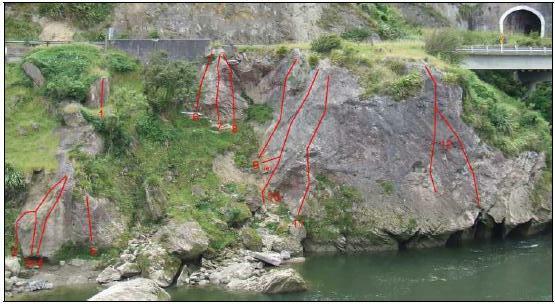 This is the indirect start to "Impatience," which eliminates the washed out, bouldery, crux beginning moves. Start at the same belay ledge as "The Soggy Scottsman" but traverse right, using the painted bolt hanger as the first clip, until you get to the 3rd bolt of "Impatience." Finish straight up the wall to the "Impatience" belay. This was the first line bolted by Matt in the Gorge. Originally this route was a grade 19. After the high waters of the '06-'07 winter, the banks have washed away a bit and now the start is a bit harder and a LOT lower than it was originally. As that the crux is within the first few moves, a new "first bolt" was added so that the start can be worked with less chance of injury. (5 bolts, DCB). At the top of the cliff there are a few old bolts, which were the protection for the original climbs at Balance. The status quo for the "routes" on this face is a) get someone to lower you down and then top belay you, or b) set up a single line abseil, go down on a gri-gri and then belay yourself back up. Hopefully a way to place a platform at the bottom of this climb can be devised and a line of proper bolts can be placed. Of course, there is always the deep water solo option!